The cornerstone of Chilkoot Café and Cyclery’s philosophy of bikes sales is fit. If the bike fits properly, the customer will enjoy the cycling experience. When shopping for the proper bike make sure your shop of choice has properly measured you for your new bike. Just having you stand over a bike or looking at you isn’t enough. At Chilkoot we measure every customer to properly match body size to frame size. Then once you have selected the bike of your dreams we customize the fit to you. Lee Stylos, PhD. in exercise physiology and owner individually adjusts the bike to your riding style and comfort level. This is an open ended process that always allows you to come back for fine tuning. This is an included service that will make your ownership experience the best it can be. Once you have decided on a frame geometry the first step in the process is to make sure the frame we choose fits. Most bike shops just have you stand over the top tube as if that is the only measure that matters. At Chilkoot we measure inseam, trunk length, overall height and shoulder width, do a bit of math to make sure the frame size we pick will bring out the best performance that the geometry can provide. In a static fit we put your bike and you and a trainer, have you ride a bit to get your sits bones comfortable and then have you stop at specific places in the pedal rotation. That's the static part. We begin by adjusting saddle height and saddle fore and aft positions to get maximum power. We then turn to adjusting your position in the cockpit (front of the bike) for optimal handling and comfort. Then you ride and we continue to make adjustments based on your specific feedback until you get the comfort and performance that you deserve. 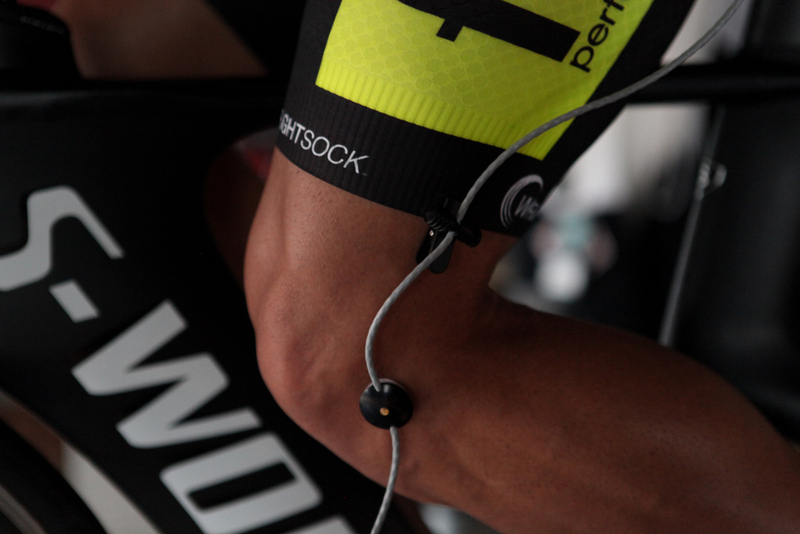 In our minds, dynamic fitting is the most accurate way to fit a rider. We use the Retul 3D motion analysis system. Eleven infrared sensors are placed at specific anatomical landmarks on each side. Using Retul's infrared camera and proprietary software that can measure rider position and bike parameters with millimeter accuracy. We have you ride under a known load while data is being acquired. The system accuracy combined with measurements taken while under a normal power output yields unparalleled fitting accuracy.